Our Orthodoxy is the only truth. It is not an idea, a theory, a system. It is our Lord Jesus Christ Himself that assures us He is the truth, when He says: "I am the truth" (Jn. 14:6). This God-man is our Orthodoxy! Our Orthodox faith is not a premise for knowledge. It is mostly a correct way of life. Orthodoxy is identical with orthopraxis. * It is the exact observance of tradition. * It is our preparation to confess the faith and for martyrdom. * It is the ascetic spirit by which we must be governed. * It is the love of the poverty of Jesus and the avoidance of consumerism. * It is our honest morals and the rebuke of those who deviate from them. * It is the longing for the unity of Christians, according to the desire of our Lord: "That they may be one" (Jn. 18:11), on the basis, however, of the only truth, and not the oikonomia of love, which is shown by many at the expense of truth. Christ calls us all throughout the ages not only to meet Him, but to live His own life within the Church He Himself founded. The consistency between our acts and words are the most conclusive evidence that our faith alone is correct. 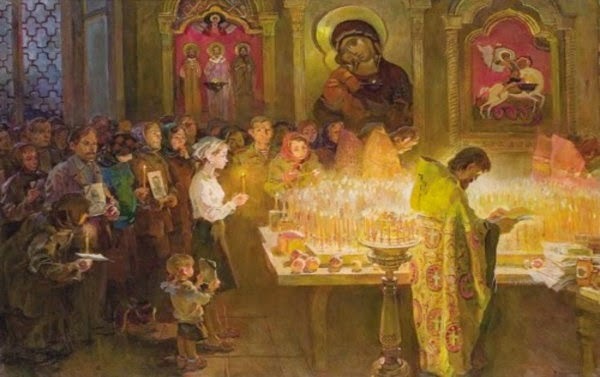 The Christian who lives united with Christ through prayer and participates in the mysteries and common Orthodox worship is in complete safety. They have knowledge of salvation and belong to the rational flock of our Lord, not jeopardized by the wolves in sheep's clothing, the various heretics (Jn. 10:1-16). Only Orthodoxy saves human beings, since this is the revealed truth. It is our Christ, Who came into the world to "preach the gospel of God" (Mk. 1:14), to teach and "testify to the truth" (Jn. 19:37). When a human being, therefore, comes to know the truth and lives it, they are liberated from sin (Jn. 9:32) and partake of true life (Jn. 14:6). Christ is the truth, He is Orthodoxy, and to its opposite lies deceit and heresy. Deceit denies the truth and heresy distorts it. For this reason one who has fallen into deceit or led astray be a heresy has distanced themselves from Orthodoxy and thus loses the possibility of salvation. This was emphatically stressed by the divinely-wise Elder Epiphanios Theodoropoulos, when he said: "Only within the Orthodox Church does salvation exist." Our Church, which is "the pillar and foundation of truth" (1 Tim. 3:15), from early Christian times, by the Holy Apostles and their successors, fought hard to keep the truth intact and undistorted, to shield the Christians from the deceitful teachings of "false teachers" and "false prophets" (Matt. 7:15; 2 Pet. 2:1; 1 Jn. 4:1). * Believes in the Holy Trinity - the Father, the Son and the Holy Spirit. * Accepts and confesses that Christ is the Son of God, the God-man Jesus, Emmanuel, and that He is the Savior and Redeemer of the world. * Is baptized in the name of the Father and of the Son and of the Holy Spirit, and is chrismated with Holy Myrrh, which symbolizes the gifts and graces of the Holy Spirit. * With their life and actions they daily try to progress spiritually and remain a living cell in the body of the Church. * Honors the Panagia and our Saints and venerates their revered icons with the understanding that the veneration is ascribed to the prototype. Thus, every Orthodox Christian home has their icons and devoutly we who dwell therein light a lamp with a shining light before them. All Orthodox Christians are brethren and members of the Church founded by Christ on the Cross where He spilled His all-holy Blood. In our days when everyone proclaims their own beliefs, why should we Orthodox Christians deny ours? Faith does not remain concealed, but is publicized, and it is not a feeling, but the knowledge of God. It is the personal response of human beings to the call of God for salvation. Even the demons believe, but they do not keep the faith in their lives. Though embattled the Church is victorious, and though Orthodoxy is embattled it triumphs and demonstrates that it is an organization founded by God, whose head is the God-man Jesus Himself, Who remains "the same yesterday and today and forever" (Heb. 13:8). The triumph and glory of the Church of Christ has always been its persecutions and martyrdoms. In the catacombs the Church erected a trophy of victory, it built sacred altars on which through the ages there was "cut in pieces but not divided," "eaten but not consumed" the "Lamb of God, Who takes away the sins of the world." The wars and persecutions suffered by the Church of Christ and Orthodoxy till our days cannot be numbered, because being founded by God as an organization from its inception until today it has received the visible and invisible arrows of its enemies, seeking to devour it. Each time the haters of good take different forms of attack, "like a roaring lion looking for someone to devour" (1 Pet. 5:8), but the unfortunate ones do not know that Christ always conquers, Christ triumphs, since He is the conqueror of death, "the light of the world" (Matt. 5:14), "the life and resurrection" (Jn. 11:25), "the way", and the only "truth" (Jn. 14:6). Today the haters of good fight against Orthodoxy with heresy, with secularism, with the search for money, with the acquisition of assets, with pure fun, with relaxed tourism, which is more that just sight-seeing but also self-indulgent enjoyment, binge eating, the over-consumption of wine and alcohol, every kind of physical pleasure, all of which are looked upon with disgust by the Apostle Paul when he says: "Let us eat and drink, for tomorrow we die" (1 Cor. 15:32). It is fought against by an outlandish lifestyle, by its deafening music, by drugs, by the internet, which is the Achilles heel of culture, and from which death enters the body of the Church, to its members who have forgotten the command of the Apostle to the Nations: "Stand fast and preserve the traditions" (2 Thess. 2:15). The enemies lurking in the Church, however, are Trojan horses, and an enemy that is stealthily trying to destroy Orthodoxy is ecumenism, which devises various ways to throw us into a poisonous embrace with the azymists, who stress the primacy and infallibility of the Pope, which with the Unia and economic power at its disposal ravages like a steamroller those on the road of Blessed Orthodoxy who have the stance: "Fight to the death on behalf of truth, and the Lord God will fight for you" (Wisd. of Sir. 4:28). There must be caution, however, when we claim to be Orthodox, because there are those who act unorthodox and practice a profession in sharp contrast with the faith and life of our Orthodoxy, such as astrologers, mediums, sorcerers, seers, fortune tellers and tarot readers. Orthodoxy is not meant to embellish our life, like an outfit we sew to our own measurements. It is an exact rule of faith and an exact way of life. The Orthodox Christian must have an Orthodox experience, an Orthodox way of life. Many who call themselves Orthodox Christians live far from the spirit of Orthodoxy. The denial of the true doctrines of our Orthodoxy withdraws us from our identity as Orthodox, along with a consciously unorthodox way of life. The Orthodox Church is vigilant and sees the pitfalls set by the devil for many of us who completely reject all the activities, tricks and professions which submerge souls into chaos, for they militate against Divine Providence and the teachings of our Christ, the source of truth. The future of human beings belongs to the Providence of God. Only He knows it and it cannot be unraveled by seers, astrologers and tarot readers. Not even the zodiac signs can interpret the future. By believing in such things and futurologists we distort the meaning of free-will and in turn the responsibility of people for the way they manage their life. We stress that an Orthodox Christian is one who only believes like an Orthodox and struggles to live like an Orthodox. This does not mean they will be sinless, as if Orthodox are sinless. Sin is within the nature of transient people, a universal phenomenon of life. For such, however, the Orthodox Church is a bath where we are washed through repentance and confession. Those who live in an Orthodox manner their Christian life and have an Orthodox journey of life know how to repent of their mistakes, to seek the mercy of God, with the belief that God forgives, that they may firmly proceed on the rough and ragged path of life.